What a great walking adventure. Ed was just the right person for the tour - he was very knowledgeable and his architecture background allowed him to point out wonderful tidbits about the architecture and monuments of the old city. The combo package was totally worth it - we set out in he morning for a two-hour amble around the different plazas downtown with an architect who was passionate about the history of Savannah and the stories behind its buildings and landmarks. It was late August so very hot and humid, so the tour was an amble and stretched out to almost three hours. After lunch, we took the trolley and had a truly entertaining guide who told us even more stories some slightly exaggerated but oh-so funny and made the tour worthwhile. We just stayed on for the whole ride, then stopped off at a couple of the sights the following day. Savannah is beautiful, and these tours are a great way to see this historic, colourful city. Excellent time..what better than bringing a city alive by a former city architect/engineer. Knows where every thing/one hides! Only wish it had been an entire day! Competent and entertaining guide on our stroll through the parks and city. If you have an interest in history and architecture, this is for you ! Good way to see the city. Our tour guides were very knowledgeable and friendly. The trolley is very convenient for seeing the city in an overview and the hop on/hop off option is great for exploring a bit more. We had never been to Savannah before and this tour was very informative. We learned so much about the history of Savannah and the surrounding area, all the while getting to see the beauty of the city and it's historic buildings. We would highly recommend this tour. We had a great tour. Ed was so knowledgeable about the city. My husband is in real estate and Ed's know-how about how the city developed and is still developing was fantastic. He's the best! The best of both worlds. 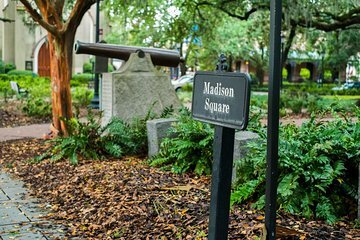 First a guided walking tour with an architect explaining the history of the town, the beautiful squares why and how they were built the way they were and discussing many of the very historic buildings in downtown Savannah. Second a leisurely hop-on-hop-off, fully narrated tour on our own where we could spend the time we chose at the stops we chose.